parkrun is a free weekly opportunity to connect with others in your local community with a 5k run or walk. You can also volunteer, or simply get outdoors for a little socialisation! Everyone’s invited to participate, and it doesn’t matter how quickly you get to the finish, as there will be people cheering you right on through. It’s enough of a challenge to reach the milestone of completing 50 parkruns, but even more so when you achieve it while living with an MSK condition. 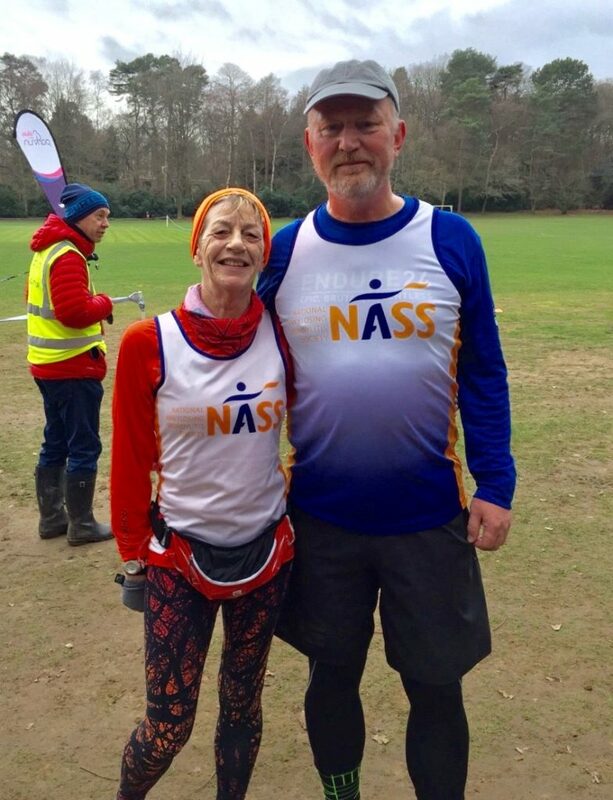 Dr Kathy Miller and John Wilkinson both have axial spondyloarthritis (ankylosing spondylitis – AS) and completed that magic number 50 together, just a few weeks ago! Here’s what they had to say about it. I first had symptoms aged 8 and went through years of endless trips to the doctor and was told that I had growing pains. When I stopped growing, I was continually told that I was too young to have joint problems and that the pain was psychosomatic. I was eventually diagnosed with AS 34 years later, aged 42 and as a result am a strong advocate of raising awareness of AS as often as possible. I’m one of the very lucky ones though and learned at a young age that when I exercised, I felt so much better so I lead a very active lifestyle, determined not to be beaten down by pain. My initial treatment after diagnosis comprised steroids and NSAIDs but they made me so horribly ill that within 2 years I had to stop taking them. Once again, exercise became my go to way of of dealing with the condition but as I got older, the symptoms worsened and also having hypermobility syndrome led to very frequent injuries and many orthopaedic surgeries on knees, back, neck, shoulders, elbow and hip (21 so far). I took up long distance walking in 2014. The pain could get really bad but taking part in ultra distance walking events became a way to take back control. Two years ago I was lucky enough to be prescribed the gold standard treatment for AS, which involves self-injecting ‘anti-TNF’ medication once every two weeks. Within a week I felt like a totally different person and I’d also signed up for parkrun. My dream of being able to run again, something I hadn’t managed to do since my teenage years, seemed like a very real possibility. Over the last two years I started walking at parkrun, gradually adding in a little running as and when I could (I still pick up injuries very easily). When I can’t walk or run, I always try to volunteer instead and love supporting others. My favourite role is tail walker – being able to help others achieve their goals is incredible. My home parkrun is at Homewood, a lovely undulating trail course. The community there is just truly wonderful with great encouragement and support always on offer. I’ve gradually reduced my time from 44.07 to 36:41 and since you’re never too old to improve, I’ll be working on that some more! Unlike Kathy, I did not notice any AS-like conditions until I was 51. I was practicing a full contact martial art and my neck got stiffer and stiffer. After 2 years of physiotherapy, chiropractic and osteopathy treatments my GP referred me for blood tests which indicated I was HLA B27 positive. I was prescribed sulfasalazine and anti-inflammatories and I have been pretty stable since. I joined my local NASS group (meeting Kathy whom I look to as a mentor) and they pointed me towards the RNHRD in Bath where I have received excellent advice and treatment. I have found strength and inspiration from other groups of people – and leading the way in this are NASS and the Facebook group ‘parkrun for people with MSK Conditions’. NASS expedited my route to getting good treatment and the Facebook group keeps me in touch with people similar to me. parkrun has been transformative as it manages to inspire individual people to extend their boundaries – yet does so in a fun and supportive way. Reaching my 50th recently was a fantastic milestone. It could be worse. Lots of people have worse conditions. I wasn’t diagnosed until I was 53 years old. The best coping strategy is exercise and I love exercise. It would be awful if I shouldn’t exercise. It has caused me to look at my health more completely than I ever did before. That’s definitely a positive thing, and I would probably be more unhealthy now if I hadn’t been diagnosed with AS. It’s an excuse to do yoga! Click here to learn more about parkrun and register to attend.